But, hang on, it’s not peach season! Luckily, I discovered these frozen organic peaches. The perfect fix for the winter doldrums. Freezing produce that is about to go bad, or buying in bulk then freezing is a great way to reduce food waste, lower food expenses AND best of all it makes your smoothie cold without having to add ice. One less step. 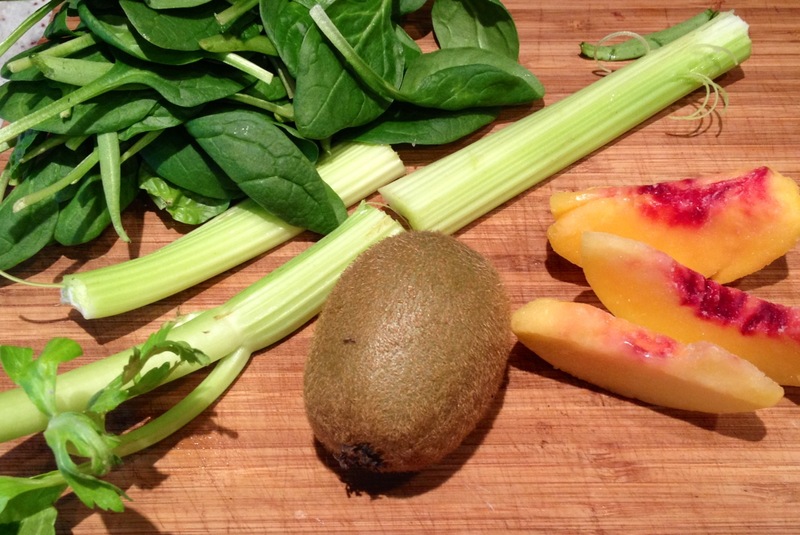 It is, however kiwi season, so I combined the two in this simply delicious delight. You could swap the peach for mango or frozen pineapple–just remember, use frozen fruit with No added sugar! I actually put up peaches this summer past, and broke them out this month! And now you’re telling me kiwis are in season! Super! This smoothie may not be as good as a ripe summer peach, but it could get your through until peach season rolls around again! love that you’d just broken them out when this post landed! BTW the view from Varenna over sunny lake Como with snow capped alps mountains in the back ground is incredible! Are you there!? Are you kidding me? That is so peachy! I looked for darn kiwi. Ours were hard as a rock at the store.